Benedict XVI, addressing the 40,000 people present in Saint Peter's Square, spoke of his "joy" at the possibility of welcoming the head of the Armenian Church. "His presence", he continued, "revives within us our hope for the unity of all Christians". 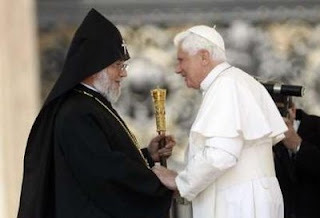 The pope then recalled "the unforgettable visit made" by Karekin to Rome in 2000, immediately after his election. "In meeting with him, John Paul II gave him an extraordinary relic of Saint John the Illuminator", a "father" of that Church whose "commitment to dialogue" he emphasised. Benedict XVI said that he is "certain that the current visit will contribute to intensifying the relations that exist between our Churches", and to "advancing hope along the road of ecumenism". The Lord, he added, "never abandons us on our journey", and in our "efforts to overcome every laceration in the living fabric of the Church". Benedict XVI then gave thanks "for the accomplishments reached in this journey that leads to the full communion of all the disciples of Christ", and he finally repeated his exhortation to prayer for unity that he addressed to Catholics during his recent visit to the United States.